A co-investment plan involves you investing your own money in company shares. This kind of plan is often aimed at more senior employees who may be expected to be able to afford to have a chunk of their money invested for a period in the company’s shares, hoping those shares will rise in value over the period but knowing that some of their own money is at risk if the share price falls. It’s rare that you would be expected to write a cheque, more often the money that you invest would come from your cash bonus, or you may be able to ‘lock up’ shares that you already own. Commonly what happens is that when you join the plan you agree at the beginning the amount that you will invest and you agree to hold the invested shares for a period of time. At the end of that time, the plan may say that you have the right to get extra shares without paying for them. These may be called ‘matching shares’, but unlike Matching Shares under a SIP, there won’t usually be any potential tax advantages. The number of matching shares you get will be linked to the number of shares you bought at the beginning and may also be linked to the long-term performance of the company. If you withdraw your invested shares early, or if you leave, you probably lose the chance to get some or all of the matching shares. You would not usually face employment taxes on shares that you have bought at the full price out of your own money (unless special rules apply), and any growth in value of those shares would normally come within the capital gains tax rules. The capital gains tax share identification rules may be relevant. But where you get shares free or without paying the full price, you would usually face employment taxes on the value of the free shares, or on the discount. Co-investment plans can be very different from one another- if your own money is going to be at risk it is especially important that you understand how the plan works and how your awards are expected to be taxed. You should think about what happens if the share price rises and, perhaps even more important, what happens if the share price falls. The information on this website can only be very general and you may want to get your own individual advice. If you join the plan, you may be able to, or be required to, use some of your bonus in order to pay for your shares. Sometimes you may be able to buy shares cheap if conditions are satisfied. If this happens, employment taxes will apply to the discount. 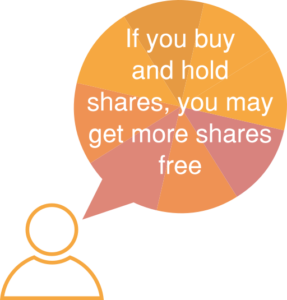 Sometimes, if you buy some shares, the company will give you more shares free. If this happens, employment taxes will apply to the value of the free shares. Your employer will usually have to account for the taxes under PAYE and may put in place arrangements so you can sell enough shares to cover the tax amounts you have to pay. Many people benefit from their capital gains tax annual exemption if they make a gain when they sell their shares. If you sell your shares at a profit and the gain is big enough, there may be capital gains tax to pay. If there is, it’s up to you to pay it, the company doesn’t do this. Click to the Tax page. What do you know about being a shareholder? Click for more information on Shareholders and Companies. Click through for different information If you are offered the chance to purchase Partnership Shares under a SIP.